To order Blue Majik in powder or capsule form, please click HERE. This simple recipe will knock your socks off. It takes about two minutes to make; it's delicious; it cleanses and rejuvenates the entire body; and it's so beautiful. Blue Majik is a rich source of Phycocyanin — a powerful, deeply detoxifying antioxidant, an AquaBotanical, which can quench free radicals and has been shown to be a potent natural COX-2 inhibitor. 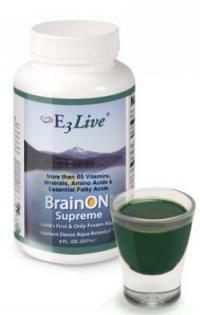 Phycocyanin is being studied more and more by scientists around the world in recent years. The word “phycocyanin” comes from the Greek word for Algae “phyco” and the Greek word for blue “cyan.” Phycocyanin is an amazing water-soluble blue pigment that gives Spirulina its bluish tint. 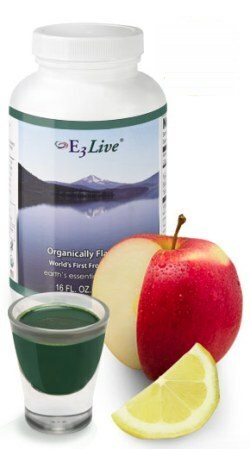 Phycocyanin is only found in blue-green algae like Spirulina—you can’t get it in other foods. 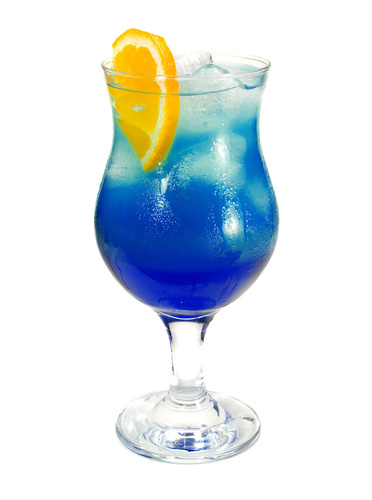 Having this Blue Majik Cocktail (aka Blue Magic Cocktail) daily will do wonders for your vitality, energy, appearance, and confidence! Put the powder into a glass, add the liquid (chilled or room temperature), and mix well until the powder is dissolved. 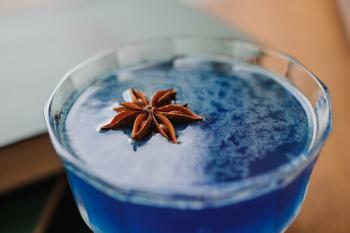 Pour into cocktail glasses (or other favorite glass) and top with a star anise as pictured. The color is absolutely resplendent so make sure you put this in a see-through glass. Enjoy this salubrious cocktail morning, noon, or night. The star anise is mostly for decoration although it will impart a small flavor note of licorice if you let it sit in the refrigerator for a couple hours or more. At my local juice shop, I get different fresh blends of juices... apple/rose, apple/lavender, apple/pomegranate, watermelon/mint, and more. All of these blends work well for this cocktail, too. A simple coconut water is delicious for this cocktail. It's always a stunning color and enjoyed by all ages, even children. This star-shaped seed pod of an evergreen tree is about one inch high with eight segments and a dark brown rust color. It get its distinctive licorice taste, like regular anise, from a chemical compound called anethol. However, the two are not related botanically. The star anise is a member of t he Magnolia family. It's one of the spices in Chinese five-spice powder. In traditional Chinese medicine, this beautiful star anise is prescribed as a digestive aid and to help cure colic in babies. It's available in Asian supermarkets and also in most grocery stores in the spice section. When you get it home, store the star anise in a sealed container in a cool dark place; it will last for several months. Throw it out (or put it in your garden's soil) once the flavor fades. If you use it in your simmered or other dishes, star anise is usually added whole (don't break it up into pieces) and discarded before serving. The next recipe is scrumptious, too.